Five minutes into the opening comments of Syrian Ambassador Bashar Al-Jaafari, the UN webcast cut off. The thousands of journalists, political analysts, and others who view UN webcasts each day from all over the world were denied the ability to watch the press conference, and hear what was said. This is not the first time this has happened when Bashar al-Jaafari is speaking. This occurred on June 7th earlier this year, and on numerous occasions throughout 2013. Reporters at Inner City Press reported that this is not accidental, but was ordered by Michele DuBach, Acting Deputy Director-News & Media Operations. This comes in the context of other UN harassment of Syria. UN Secretary-General Ban Ki Moon has met with Ahmad Jarba, a leader of violent insurgent groups in Syria, but has refused to meet with Bashar Jaafari. Though Syria pays over $1 million to the UN each year, it is not being treated as an equal member state. 1. ↑ Examples of msm 'reporting' of the 2014 Syrian elections include: The Clever, 'Democratically Supported,' Bloodthirsty Tyrant (4/6/14) by Daniel dePetris of the Huffington Post, Syria Election: Experts Weigh In (2/6/14) – Voice of America, Landslide win for Assad in Syria's presidential elections (4/6/14) – Haaretz, Syrian election sends powerful signal of Assad’s control (3/6/14) by Liz Sly and Ahmed Ramadan of the Washington Post. (In comparison to the rest of the msm the report in Israel's Haaretz is surprisingly factual and balanced – Ed). 2. ↑ According to the report cited above from Haaretz which can hardly be accused of bias towards the Syrian government, 88.7% of the 73.42% of eligible Syrian voters who voted, voted for President Bashar al-Assad. So, of 15,845,575 Syrians eligible to vote, eligible voters 10,319,723 or 65.13% voted for Bashar al-Assad. No-one who, elsewhere, chose to loudly dispute the legitimacy of that election could bring himself/herself to show the courage of his/her convictions by challenging the testimony of those observers at that press conference. What other political leader in the world, particularly from nations hostile to Syria – the United States, France, the United Kingdom, Israel and Australia – can claim to have anywhere near as much popular support as Syrian President Bashar al-Assad? The legitimacy rightly enjoyed by President Bashar al-Assad dwarfs that that can be claimed by of any one of his opponents: United States' President Barack Obama, British Prime Minister David Cameron, French President Nicholas Hollande, Israeli President Benjamin Netanyahu and Australian Prime Minister Tony Abbott. I'm referring to the video above. Incredible report! Starts out a little slow, with a Syrian diplomat introducing English speakers from the US who went to observe the Syrian elections. When these observers start talking it is most interesting, most edifying. They are from peace groups and Syrian-US NGOs. Their observations are absolutely fascinating and confirm how utterly dishonest and dangerous the NATO reporting and actions on Syria are. Apparently this film, which was more important than any news I have seen on mainstream press, was broadcast for only 5 minutes by the UN Newscast. It goes on for nearly an hour - all of it rivetting for anyone interested in seeing democracy in action and real reporting. The Syrian diplomat also makes a contribution which, at around the 27 minute mark, talks about Aid from Australia and Luxembourg. Apparently he asked for wheelchairs and some ambulances for people injured in the war in Syria. He waited a year, listening to Australian foreign aid people and others from other nations make tear-jerking speeches about the tragedy in Syria, but he never got ANY wheelchairs, let alone ambulances from pathetic, hypocritical official Australia. There is a really silly article about Syria on online opinion here http://www.onlineopinion.com.au/view.asp?article=16435 The comments are all pretty naive as well. The following was added to the forum discussion about Syria, referred to above. As Paul Night has already advised, the article and nearly all of the posted comments are a waste of most people's time. Some of the factual contributions content could be of interest to scholars of obscure, specialised aspects of Syrian history, but little is relevant to the life and-death struggle that the Syrian people have faced these last three years. An exception is the post which preceded that post. That post also confirms what we have said about Syria on candobetter. Over 160,000 Syrians have died since March 2011 as a direct consequence of the decision by the rulers of the Western 'democracies' and Israel together with the dictatorial rulers of Saudi Arabia and Qatar, to launch a war against the people of Syria and its government. Australian governments, including the previous 'Labor' government, and particularly former Foreign Minister Bob Carr, have been shamefully complicit in this grotesque crime against humanity. The Australian 'news' media has also misled the Australian public about Syria since March 2011. 10,319,723 or 88.7% of the 11,634,412 who voted or 73.4% (the figure should be 65.13% - see Footnote 2 above - Ed) of all 15,845,575 Syrians eligible to vote, voted for Bashar al-Assad. What other political leader, can claim to enjoy anywhere near as much support? Compare this support for President al-Assad with that achieved by President Obama in 2012. compared to 73.4% of all Syrians, both at home and abroad, with the enormous difficulties they faced, a mere 29.7% of eligible voters voted for Barack Obama in December 2012 (see http://en.wikipedia.org/wiki/United_States_presidential_election,_2012 http://elections.gmu.edu/Turnout_2012G.html). The fact that the Syrian Arab Army still controls nearly all of Syria after 3 years of conflict is further confirmation that claims that Bashar al-Assad has overwhelming support. What dictator, so hated and corrupt as has beenS claimed by the media has been able to cling to power, without any help from a foreign army of occupation, for so long? 'Strange' to challenge mainstream media Syria narrative? At (previous post), Plantagenet wrote, "Your odd posts which appear to be blaming Western and Sunni Governments for the sins of Syria's Shiite regime are more than a little strange. Are you sending this stuff from Damascus?" Why strange? Because they don't swallow the nonsense put out by our press? The explanations we get for NATO shennanigans are a lot stranger than reality, IMHO. I'm writing from Melbourne, but the video I linked to was of US observers filmed in a UN forum. I am blaming the US/NATO because I do not see how a civil war unsupported by the majority of Syrians could have gone on so long in the absence of their underwriting, interference and massive propaganda. The Syrian government was not and is not a 'regime', nor is it religious. Syria is a non-sectarian state. Much of its law resembles the French civil code as usually happens to once-French colonies. Religious extremism is coming from the outside, including the awful Gulf States in league with NATO. Syria contains several strong tribes, used to settling differences between them. Their members are of all kinds of religions and non-religions. Outside interference is destroying a functional state. I have a background in petroleum politics so I can see why US/NATO is messing around in this region, trying to isolate both Iran and Russia. My knowledge here alerted me to the extreme superficiality of mainstream press reporting, a la Murdoch, Fairfax, CNN. I did some research by talking to a lot of Syrians, here and elsewhere and using other news sources. Syrian Girl Partisan is a fantastic source you may not have heard of: Two weeks prior to recently concluded elections Syrian Girl argues case for Syria at http://candobetter.net/?q=node/3861 and (articles about) Mother Agnes Mariam: http://candobetter.net/?q=taxonomy/term/4510 . NOTE: I also tried to find out why Bashar al Assad was supposed to be such a brutal dictator. I have yet to find out why. Do you know why? I promise you I have looked long and hard. Even to Hilary Clinton's reasons for viewing Bashar this way in her diary on her role as US Secretary of State, e.g. here: Review: Hillary Clinton's Hard Choices - the Syria Chapter at http://candobetter.net/?q=node/3906 . The following was posted to an Online Opinion forum about Syria on 14 August 2015. The claim that "the US has become a de facto ally of Assad" is idiotic. Since March 2011 the United States has been supplying arms and money to hordes of foreign terrorists waging a war against the people of Syria, including Syrian Christians (who speak the same language spoken by Jesus Christ) and even the small Syrian Judaic community. So far, as of August 2015, that war has cost the lives of more than 220,000 Syrians by one estimate. On one previous occasion, in July 2014, those attempting to demonise Syria's popularly elected President Bashar al-Assad as well as to portray the terrorist war against his government as some kind of popular uprising, seemed to have lost their voices when confronted with evidence and logic. I don't suppose that anyone here, would care to show other site visitors why BiancaDog is wrong at http://forum.onlineopinion.com.au/thread.asp?article=16435#287856 ? (i.e. <a href="https://candobetter.net/node/3445">Syria's press conference the United Nations doesn't want you to see</a>) it could greatly lift the profile of candobetter. Thank you, Leslie on Saturday, 15 August 2015 12:57:43 PM for that helpful information. I agree with your proposal that no-one, who, like Professor Alon Ben-Meir, fails to acknowledge and respond when fallacies in his/her articles are pointed out, should be allowed to continue to contribute. By the way, please feel welcome to post a comment in response to any article posted on the site https://candobetter.net which I help administer. We don't censor anything (except for forum spam or material which is abusive and/or illegal). Thank you, Geoff of Perth for your post of Saturday, 15 August 2015 1:54:22 AM. Most of Thierry Meyssan's journalism is published on http://www.voltairenet.org/en . Thierry Meyssan was present in Libya during the NATO invasion of 2011 and has since also travelled to Russia and Syria. Other sites on the Internet which provide truthful information about Syria include the Syrian Arab News Agency's site at http://sana.sy/en, http://syrianfreepress.wordpress.com/, https://landdestroyer.blogspot.com. ttbn wrote on 15 August 2015 11:22:05 AM, "The U.S has a record of supporting some really rotten people all around the globe ...". This includes the Kingdom of Saudi Arabia, the Qatar dictatorship, Israel, and the current rulers of Libya, Turkey and Ukraine. ttbn continued "... Assad [is] probably not the finest of men [but] doesn't kill people in the name of Allah." In fact, the evidence shows that President Bashar al-Assad is one of the great political leaders of the 21st century. I would personally rank him alongside JFK. If Australians were to ever learn the truth about Bashar al-Assad, they would much prefer him as Prime Minister to Tony Abbott or even to Bill Shorten. Could anyone imagine Tony Abbott or Barack Obama lasting over 56 minutes with an informed and hostile interviewer as Bashar al-Assad has been able to do on this and other occasions? This is surely evidence that their claims against him could not possibly be true. This comment has also been posted to the JohnQuiggin.Com forum web-site. Why do you trust this source? I was asking about the only source mentioned in the only comment of yours that I linked to. I had not realised that you had linked to the post you were referring to. I am not in the habit of linking to other posts as I prefer to use the one link allowed by the forum software for JohnQuiggin _dot_ com to link to other sites, usually my own. I trust that video, because it is consistent with everything else I know about Syria. Of course, I cannot know for certain that the whole video, including crowds of supporters of President Bashar al-Assad, was not staged, but, if it was, the actors they must have hired seem to have done an extremely good job. So too, must all the many thousands of other actors in the almost innumerable other videos now available which show hundreds, if not many thousands of Syrians greeting President Bashar al-Assad wherever he goes in Syria. And now I will ask you a separate question: Why do you trust those five international observers? 2. Those journalists knew that the 'reports' they had written about Syria were untrue and that they would be shown up for the liars that they were if they had attempted to present that narrative to the press conference. By Eva Bartlett. Published 4 Feb 2015 on RT. “Welcome to the United Nations. It's your world,” reads the UN logo. Apparently, however, there are limitations as to just how “welcome” some of its representatives are. Syria's Ambassador to the UN, Dr. Bashar al-Ja'afari, was sworn in as Permanent Special Representative in 2006. Yet, in spite of his thirty plus years as a diplomat, his being highly-educated and multi-lingual, and the fact that he is the UN's official Representative of the state of Syria, the United Nations has little interest in hearing what he has to say. Not only do they lack interest, since the Western-NATO-Israeli-Gulf war on Syria began in early 2011, they actively work to silence him or distort his words. The UN has pulled endless stunts on Syria's Ambassador, with the obvious intent of distorting reality and prolonging the proxy war on Syria. This was posted as a comment in response to the article Syria and the facade of partition (5/2/16) by Alex Ray | Between Deserts. It is currently awaiting moderation. 2. the Presidential election of 3 June 2014. After that election the Syrian Mission to the United Nations held a press conference on 19 June 2014 at the United Nations offices in New York and testified that the elections were conducted fairly. 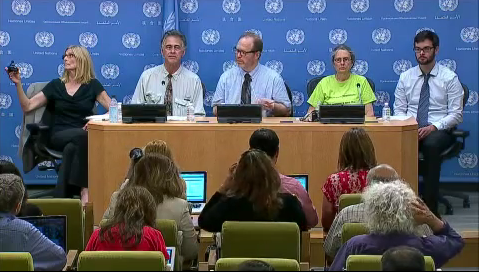 See http://www.globalresearch.ca/syrias-press-conference-the-united-nations-doesnt-want-you-to-see , and its republication above with the embedded YouTube video at https://www.youtube.com/watch?v=ZnFQd4wBXnk . If the elections were a facade, as Kerry and the msm have claimed, then why didn't anyone from those media outlets show up to that press conference? If the election was truly rigged or even if it was not possible to verify that the election had been carried out fairly, then surely those observers would have been torn to shreds under their scrutiny? Either all the agents of the msm were astonishingly incompetent for not being there or there is another explanation: They knew that if they attempted to challenge what the Syrian Mission to the United Nations were going to say, by putting the same lying narrative about Syria that they had been publishing, then the whole world would have seen them for the liars that they are. Rejects MSM narrative but still labels Syrian govt a 'regime'? "Government-controlled territory" is the correct term. Thanks for picking up on this, Dorothy. The BIG LIE that the Syrian government is a brutal regime seems to have been accepted even by a number of those opposed to the war against Syria. To the contrary, few other governments across the globe can claim to have as much legitimacy as that of President Bashar al-Assad. Not even the parties governing the formal Western democracies, which have shamefully colluded with Israel, the dictatorships of Saudi Arabia, Qatar, the UAE and the 'elected' Turkish government against Syria for nearly nearly six and a half years, can claim to have anywhere near the popular support that Bashar al-Assad gained in the Presidential election of June 2014. As cited in the article above, according to a report Syrian election sends powerful signal of Assad’s control (3/6/14) from the Israeli publication Haaretz which can hardly be accused of bias towards the Syrian government, 88.7% of the 73.42% of eligible Syrian voters who voted, voted for President Bashar al-Assad. So, of 15,845,575 Syrians eligible to vote, eligible voters 10,319,723 or 65.13% voted for Bashar al-Assad. That the elections were run properly was attested to at a press conference of five international observers at the United Nations on 20 June 2014. (See the article above (including the embedded 52 minute video) and the original article at Global Research. Not one of the 'reporters' who had been feeding their readers the narrative of the supposedly hated "Assad regime", and continue to do so, attempted to challenge those observers on that day. The BIG LIE that Syrian President Bashar al-Assad was a corrupt murderous dictator was demolished at the United Nations headquarters in New York on 20 July at a United Nations press conference of five international observers who had observed the Syrian Presidential elections of 3 June 2014. For 53 minutes they testified that the elections in which Bashar al-Assad won were conducted fairly (see Syria's press conference the United Nations doesn't want you to see (this article including the 53 minute embedded video above)). At that, election 88.7% of the votes of the 73.42% of eligible Syrian voters, who were able to vote in the midst of the war, were for Bashar al-Assad. What other world leader, particularly amongst Syria's enemies, can claim anything close to the popular mandate of President Bashar al-Assad? No-one from the corporate media attempted to put to the observers any one of their 'reports' that the Syrian government had murdered tens of thousands of defenceless Syrian civilians, tortured political prisoners, used chemical weapons, bombed hospitals and schools, .... Their failure to do so was surely criminal negligience, that is, unless they knew these claims to be untrue and would be easily demolished before the whole world by those observers. Who, amongst Bashar's enemies, enjoys as much public support? Thank you, Sarah. As you have pointed out: “Dr. Bashar Al Assad … won his latest election in 2014 with 88.7% of the votes in what international observers who were present during the elections deemed as a fair and free election”. The full 53 minute video of the press conference is [embedded in the above article]. Who amongst Bashar al-Assad’s enemies can claim anything like that much popular support, even with the all the misreporting in their favour by their newsmedia? In fact, President Bashar al-Assad is a far more legitimate national leader than the leaders of the supposed western democracies who have colluded in the killing of (by one estimate) 400,000 Syrians, including 80,000 Syrian soldiers by their terrorist proxies, since March 2011. On 19 June 2014, Bashar Jaafari, Syria's permanent representative to the United Nations in New York, conducted a press conference in which he could explain the recently concluded presidential election, of 3 June 2014, to the representatives of the newsmedia and answer their questions. (See Syria's press conference the United Nations doesn't want you to see - republished from Global Research - includes 53 minute embedded video of the press conference at: https://www.youtube.com/watch?v=ZnFQd4wBXnk). As even Israel's Haaretz newspaper acknowledged, "Syria's parliament speaker said Wednesday President Bashar Assad has been reelected by a landslide, capturing 88.7 percent of the vote" . Haaretz, whilst more factual than the rest of the corporate newsmedia, attempted to diminish the significance of the election. Other corporate media outlets were quite misleading (see articles listed in footnote 1 of the article linked to above. Not one of the reporters hostile to Syria, made the effort to challenge to Bahar Jaaafari's narrative. Surely, if the elections were as rigged and controlled as those reporters claimed, why did not even one of them even attempt to show the world that Bashar Jaafari's claims were false? Were these reporters negligent? Or did they know that, if they tried to put their claims to Bashar Jaafari, they would be shown up before the world for the liars that they are?